Over at DIYC, there are a handful of people who run these buys. I call them gluttons. The pricing on components for the hardware drop dramatically with volume, so people volunteer their time to coordinate purchases for many members. They collect money, negotiate prices with vendors, sort, and ship the parts out. 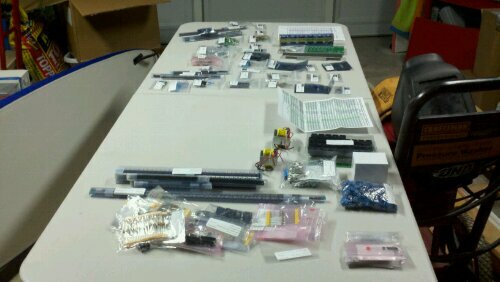 Here is a table of this year’s purchases laid out to ensure all parts are received and begin assembly shortly. This is enough controller for 176 channels. Two Renard 64XCs (and accompanying SSRezs) as well as 6 Renard SS8s. The only thing left hardware-wise to purchase this year is a pile of extension cords, lamp cord, vampire plugs, enclosures, etc. No more room for electronics left in this year’s budget.